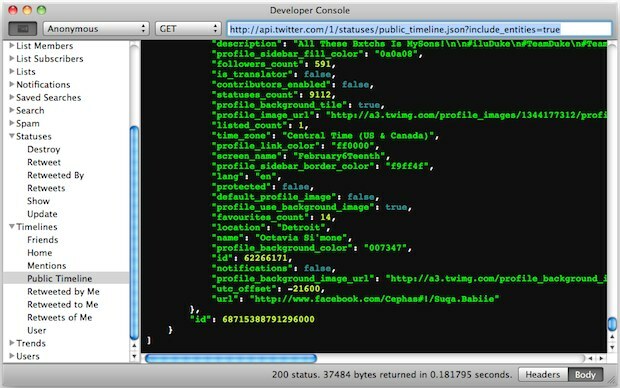 Twitter developers have a compelling new reason to update to Twitter 2.1 for Mac: the developer console! You can enable the developer features through Preferences > Developer tab > “Show Developer Menu”. Unfortunately for tinkerers and those just looking to casually poke around, you’ll need Twitter apps API keys to actually use and access the dev console. Other notable changes in Twitter 2.1 are some significant UI tweaks, font size adjusting, AppleScript support, the ability to spin tweets off into new windows, and of course various bug fixes. It’s a worthwhile upgrade, even if you aren’t a developer. You can download Twitter for Mac directly from the Mac App Store, it’s free. My only qualm with twitter for mac is that it switches my mbp to the dedicated gpu…. Wonder if the new version fixes that. Wow and I thought I was crazy, it’s been doing this on mine too. Strangest bug I’ve encountered yet, I’ll update later and see if its different. Open the .app’s contents. It includes birdcow.icns and Chicago-Bold.ttf. Anyone knows how to enable the retro look?